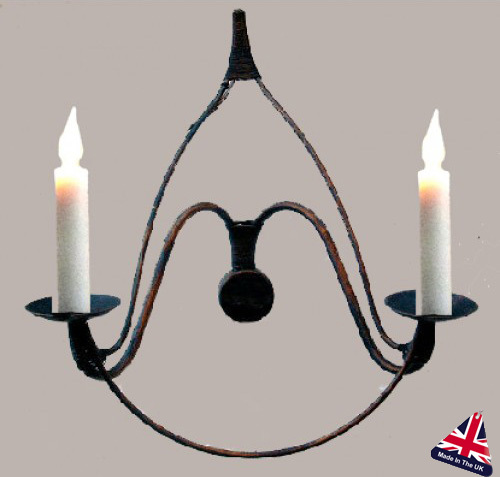 Part of the Château UK made wrought iron lighting range. Wrought iron wire made French farmhouse design two-lamp wall light in a traditional design, with two wonderful graceful curved arms on a braced wall mount. This lovely twin wall light will look fantastic in any period property. Silver with copper brush, silver, Florentine, white with gold brush, rustic, French gold, black with gold brush, matt black, silver guilt and iron. Please click here to download the available finishes. Please allow up to four weeks for your light to be crafted and delivered.